Yes! 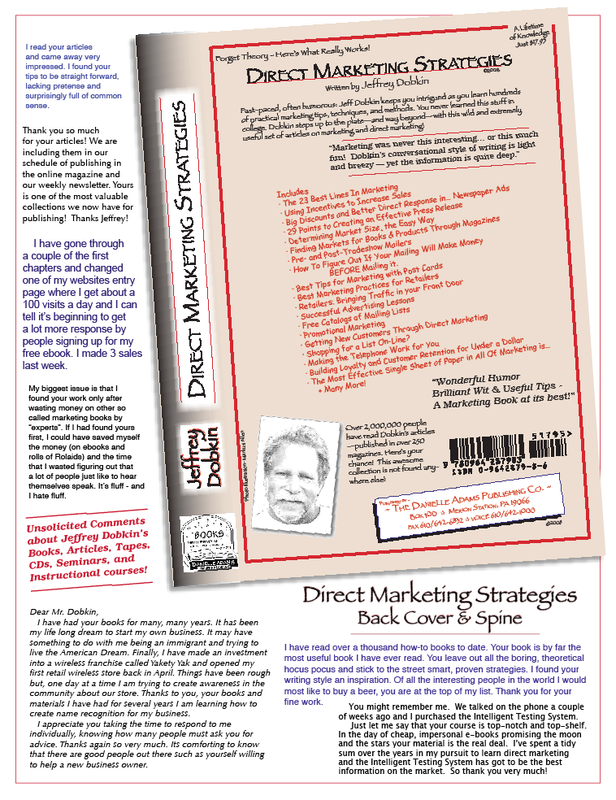 Send me your awesome book: Direct Marketing Strategies! Please let us know if we may help you in any way or if you need anything else. Thanks. Forget Theory – Here’s What Really Works! 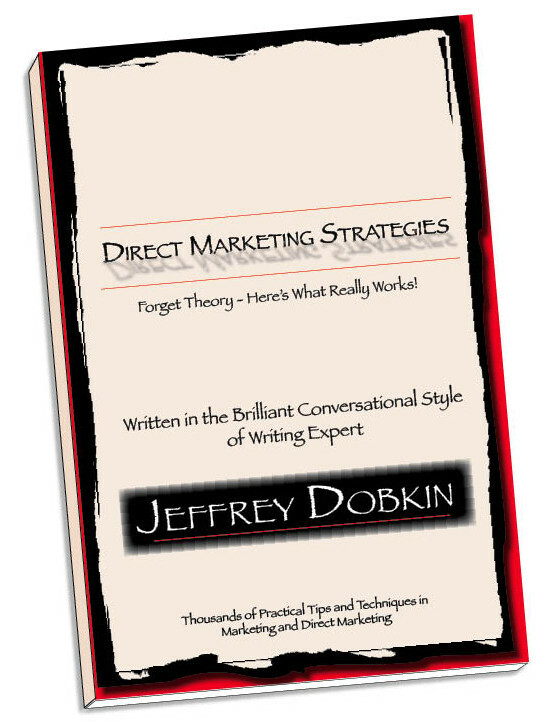 This book is a fun collection of Jeffrey Dobkin’s articles on marketing and direct marketing, written in his own breezy style. “Some articles are fast, fun and funny!” says Dobkin with a smile. “And some are so technical and academic… I don’t even like them!” he continues. This is his fifth book and an article collection of fast-paced and provocative articles. 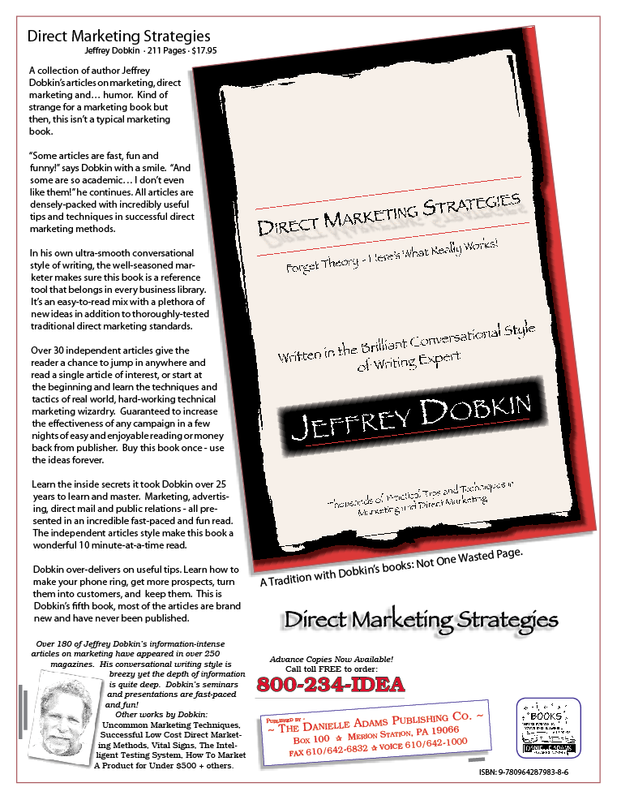 As Dobkin’s other titles, all the articles are densely-packed with practical and useful tips and techniques in successful direct marketing methods. In his own smooth conversational style of writing, the well-seasoned author makes sure this book is a practical, useful reference tool that belongs in every business library. It’s an easy-to-read mix with a plethora of new marketing strategies in addition to thoroughly-tested solid standards. Over 25 independent articles give the reader a chance to jump into this book anywhere and read a single article of interest, or start at the beginning and learn the techniques and tactics of real world, hard-working marketing plans. Guaranteed to increase the effectiveness of any campaign in a few nights of easy reading or money back from publisher. Buy this book once – use the ideas forever. To date, not one book has ever been returned. Learn inside secrets of marketing, advertising, direct mail and public relations in an incredibly fast-paced and fun read. Direct Marketing Strategies, newly edited in 2013 – where he went in and called every phone number to make sure it’s correct, price checked every item, and took out every typo and misspelling. Er… or most of them, anyhow. From The Danielle Adams Publishing Company, P.O. Box 100, Merion Station, PA 19066. Just $17.95 plus $5 shipping, handling and guaranteed safe delivery right to your door (signed edition). Phone 610-642-1000 to speak with Jeff Dobkin — this number rings on his desk. Call Toll Free 800-234-IDEA to order. Available in paperback in selected bookstores or on-line; or order right here, right now and get the e-book with immediate delivery (no shipping charges for e-book). Click here to Purchase… Thanks. Please don’t forget to sign up for our mailing list. We send out an email about every week or so – some to highlight new articles, and offer some private articles, too — just for our email subscribers! Or check our our spam-free email policy: we don’t sell or rent your name to anyone: no one wanted it.